Home / Columnists/ Bank frauds and rising NPAs: Do we have the right people in the financial industry? Bank frauds and rising NPAs: Do we have the right people in the financial industry? There are 33 banks and 48 finance companies in Sri Lanka. The financial industry which mainly consists of the Banking Financial Industry (BFI) and the Non-Banking Financial Industry (NBFI) approximately has an asset base of 12.2 trillion. This comprises total loans and advances of Rs. 8 trillion, total investments of Rs. 2.73 trillion and other assets of Rs. 1.459 trillion. It is being looked after by a workforce of 88,000 who are serving customers through 5,000 branches islandwide as of June 2018. The question arises whether the available human resources are adequate enough, trained properly and of the right quality to look after the given asset base of Rs. 12.2 trillion. 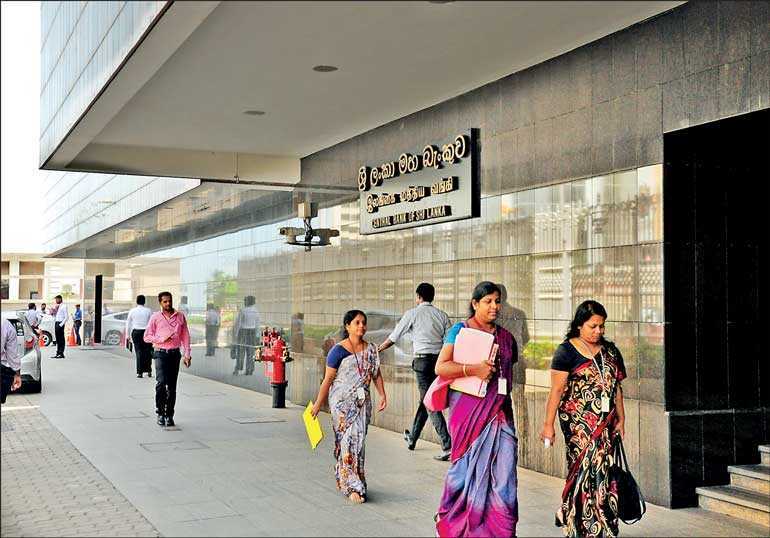 Three banks were downgraded in November last year by Moody’s Investors Service. One of the main reasons for it is the rising NPAs of those particular banks. The rating agency further predicted after years of strong credit growth, the weakening operating environment will have a negative impact on the banking industry’s asset quality and profitability. 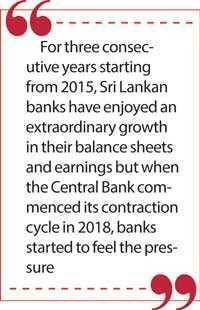 It is also noted for three consecutive years starting from 2015, Sri Lankan banks have enjoyed an extraordinary growth in their balance sheets and earnings but when the Central Bank commenced its contraction cycle in 2018, banks started to feel the pressure. In my controversial article dated 17 October 2018 under the caption ‘Economy in disarray, banks flourishing; can this be true?’ I have pointed out that the asset quality of the banking industry is deteriorating at an alarming level. It has risen up to 3.6% by the end of August from 3.4% in July 2018. It was at 2.5% at the end of 2017. During the first eight months of 2018, the total non-performing loan volumes rose by 58% or by Rs. 94 billion to Rs. 255 billion. It was further noted, in August alone the non-performing loans grew by 6.7% to Rs. 16 billion compared to the growth of 4.7% or Rs. 11 billion in July. Apart from external factors such as the weakening operating environment, it is claimed that the target-oriented approach of the respective financial institutions too has contributed to a great extent to the rising NPAs of the industry. This practice has resulted in irresponsible lending and ineffective supervision of loan accounts. Also, the lack of managerial and technical expertise on part of the credit officers and managers deteriorate quality of credit in the respective financial institutions and finally of the industry. Amongst the banks and finance companies, a huge competition exists to grab the right human resources. There are many features available in employment contracts to retain and attract employees. Attractive salaries, housing loans at low-interest rates for longer durations, vehicle loans at concessionary rates, annual bonus, performance bonus schemes, and incentive schemes to name a few. Out of these benefits, the most concerned one as far as the rising non-performing loans are concerned is the lastly stated incentive scheme which is designed to boost business targets directly by banks and finance companies. To be fair by the industry, these strategies should be in place to boost volumes of business. However, the problem starts when these strategies are misused for the quick gains. As stated before, this practice would have aggravated irresponsible lending and ineffective supervision of loan accounts.When the recruitments were done about two to three decades ago to the positions of front liners (credit officers, investigation officers, etc.) many backgrounds checks and balances were done to gauge whether the recruits were of the right quality. I still can recollect an incident which occurred in 1986 when I visited one of the quarries in Kaduwela as a credit officer on an inspection visit. I was offered an inducement to give a favourable report. As a young credit officer, I panicked and brought the incident to the notice to my AGM immediately. He summoned the parties concerned and explained to them the gravity of crime which they were to make and turned down the facility, giving the reason for the rejection of the facility as undue influence made on his officer to get the facility approved. The party concerned was not a bad party. They were doing a solid business and the business was alright. Without any hassle, they would have obtained the facility. However, due to some reason, they were made to understand an incentive should be paid to get the facility approved. Most probably the broker involved would have influenced them. But my AGM was not interested to find out the outcome of the investigation. The only criteria for the rejection which was in his mind was the dishonesty of the party. As a young credit officer, I learned an unforgettable lesson in the early years of my career. Dishonesty has no place in the financial industry at any level and under any circumstances. That lesson learned made me maintain honesty under any circumstances and at any cost during my career of 35 years in the financial industry. Probably this will not happen these days due to the competition in the market. The parties concerned would be warned and still be accommodated as they are creditworthy. From the financial industry’s point of view, unlike those good old days, the financial industry is not being fully dominated by its players i.e. banks and finance companies. The customers too are knowledgeable and demanding and mostly they decide the package on which the lease or the loan should be taken. This is the challenge faced by present-day credit officers and managers. The officers and managers should be extremely skilful when negotiating with some of the modern-day customers. I too presume it should be the way as far as the stability of the financial industry is concerned. The industry should be challenged by its service recipients (customers). Once the industry is challenged, the industry will start producing better products, quality service, and value-added features within their institutions for the survival. This will make the life of customers easy. This theory applies to all the circumstances in the universe in any form. When something is challenged it offers better performance and results for the survival. Apart from that, credit officers and managers should have a high sensing power to detect false-hearted customers, especially in the non-banking financial industry. They (dishonest customers) look very polite and easy to handle. The easiest way to identify them is that they will agree to any condition and to a rate that will be offered, as they are not interested in paying back their dues. The only intention that they have is to obtain the loan at any cost in the quickest time possible and to disappear. Counterfeiting ID cards, bank statements and tax documents are submitted to obtain advances by these fraudsters. The credit officers should have adequate skills to detect these counterfeit documents at the initial meeting itself with such false customer, as once these documents get into the system, detection of them will not be easy. Most of the time photocopies with “original seen” authentication or scanned copies go the second layer of officers along with the credit appraisal. Building up connections with fellow financiers, bankers and Government officials is a very essential aspect for a good credit officer. Just over a telephone call frauds amounting to millions of rupees can be fished-out in no time, if officers involved in credit are well linked to proper information sources. The banks and financial intuitions should encourage their credit officers to interact with their fellow officers in the industry, especially in their respective regions, more frequently. The forgeries by submitting fraudulent deeds is a common application these days in the market. Though most financial institutes don’t discuss there is a serious concern over the increase in NPAs as a result of frauds in mortgage loans. There are organised gangs comprised of ex- employees from land registries, financial institutes, and law enforcement authorities and also in some cases lawyers involved in this rackets. Due to their knowledge in their respective areas, detection of these frauds makes very difficult even to a senior credit manager or a senior panel lawyer. They prepare deeds for lands without the knowledge of the owner. Most of these owners live overseas or not within the area where the property is located. They assume that their property is safe as it cannot be stolen like jewellery. But, they are mistaken. These properties are the prime targets for these culprits. In most of these cases at some point, a copy of the deed of the property in question has been given to a third party by the owner. Maybe to a broker to find a potential buyer, or to obtain a short-term loan facility from a local money lender or some similar incident. To overcome this situation a different breed of trainers should introduce to the industry. Traditional training concepts might not work in the present-day scenario as we have a different set of racketeers operating in the market. Like viruses, they change their outer appearance from time to time. Only the smart credit officers and managers can detect them. Talking to them for long hours, checking their knowledge on their business, visiting them without accompanying them, will put credit officers on a better footing to judge them. The credit officers’ network of connections in the market is the key to success of maintaining a quality loan portfolio. Credit is not a sometime thing; it’s an all-the-time thing with 24X7 application. A dedicated credit officer is always a smart employee and an asset to any organisation. He optimises his productivity without much of a show-off. He can recommend millions of rupees to be disbursed within a few hours and still can maintain a healthy portfolio over a period of time. To overcome fraud with regard to mortgages it is suggested to apply a new approach during the verification process of the title. The traditional way of the process is calling for the subjective deed, surveyor’s plan, valuation report, visit report by the credit officer/manager, non-vesting certificate, street line certificate, and extracts for 35 years or as it is required. Apart from them, it suggested to follow below steps to avoid being victimised by these organised gangs. This mechanism will give more options to credit officers and managers to analytically analyse the genuineness of the title even before referring it to an attorney. Make it a practice to meet the Grama Sevaka (GS) of the area and get a written confirmation from him on the ownership of the property. Meet previous owners of the property as per the given extracts and as per GS’s confirmation (to find out whether they were in the possession of ownership of the subjected property and whether it has been sold or not). The outcome of these meetings will transpire many fraud attempts. Also, meet immediate neighbours (to find out the correct ownership). Another much practical suggestion to this process is to display a notice in form of a banner or a sign board on the subjected property to announce that the property is for disposal with a phone number. If this can be adopted as a market practice the racketeers will be back down and only the genuine customers will remain. No harm will be done to their reputation as the banner indicates the property is for sale (it doesn’t say the owner intends to mortgage the property).The given phone number should link to the institution from where the loan is to be obtained. These organised gangs go beyond even 35 years of records in registers in respective land registries to create false entries in different folios. They even destroy original records. They link entries to the existing deed (the deed in hand which is forged) through a few transfer deeds. The signature of the first owner in the series is forged. The other transfers have been effected to the members of their gang in irregular intervals. Once this is done, the title of the property looks clear. The supporting documents are also altered in the same manner in other local government bodies. As stated earlier, detection of these frauds should happen at the front desk of the credit department by looking at these suspicious characters and documents. Once these documents get into the main system they start flowing freely with other routing office work. The senior credit approving authorities should have a different approach. They should have their own checks and balances to verify the genuineness of the credit appraisals. They should be handpicked and allowed to work independently and smartly. They shouldn’t compensate based on the business volumes done by the institution. Instead, they should be compensated based on the responsibilities that they are carrying. The credit managers will be faced with an uphill task in the coming months due to the rising interest rates in the market. Bank lending rates vary from 10.03% to 16.43% as of 1 February 2019. The banks with foreign roots will offer low rates whilst local banks will have a serious issue in finding low-cost funding lines to accommodate their clients. This will apply a huge pressure on credit managers of some of the local banks to achieve their targets. This interest rate mismatch in the industry will make a negative impact on their respective NPAs of these banks. The Non-Banking Financial Industry too will face the same situation as their cost of funds are higher than the Banking Financial Industry. Under such circumstances, the Financial Industry should take extra precautions through their human resources, especially through their front liners to safeguard the industry. It is my personal view that credit should be handled by well-conversant officers and not otherwise. Allowing half-trained credit personnel to man the forward lines will result in unthinkable damages to any organisation. A lot of time and energy should be spent on training, grooming, screening and finally compensating them to avoid displeasing incidents taking place in the industry from time to time. A proper mechanism to effect same will curtail the ongoing issue of NPA to a greater extent.